When you’re in a long-term and properly serious relationship, it’s only inevitable that the conversation could eventually turn to the possibility of having children. Nothing can prepare you for the reality of having kids, which makes it all the more terrifying and sometimes people are never ready for this massive commitment. For those who take the plunge, they’ll be the first to admit that it’s no walk in the park and for all the difficulties associated with bringing children in to the world very few parents would ever admit to regretting it. Well, that’s until now that is. 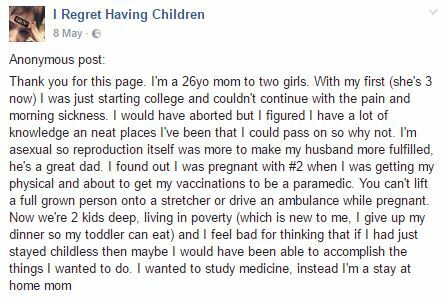 Anonymous parents took to Facebook and Reddit to reveal their regrets about having children of their own, with some even going as far as confessing that they wish their babies had never been born. 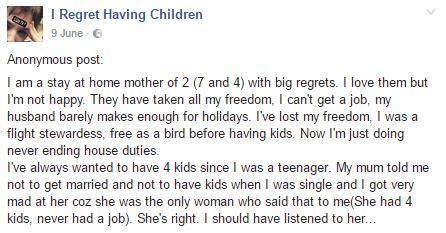 Many took to the Facebook page I Regret Having Children to vent anonymously about having kids to its 3,600 members. So if you want to have a few lil’ ones of your own one day, than maybe you should stop reading right now as it might just put you off. 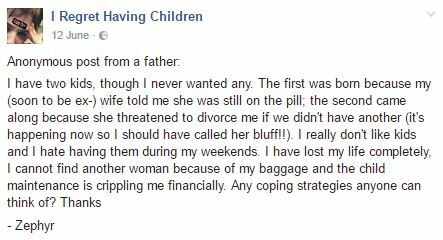 Well that’s me done with the idea of having kids for a while then.